Paris, April 16: Precious artwork held within the Notre Dame Cathedral is being evacuated, as firefighters battle to save the iconic 13th Century structure here in Paris, according to Jean-Claude Gallet, the Commander General of the Paris Fire Brigade. A deadly blaze engulfed the historic cathedral here on Monday evening, taking down the structure's famous spire, much to the horror of onlookers and world community alike. Speaking to reporters here, Laurent Nunez, the French Secretary to the Interior Minister said that both of the cathedral's towers are safe as the "fire is now weaker." Notre-Dame Cathedral in France Engulfed in Flames, Fire Fighting Operation Underway; Donald Trump Reacts. "The fire is now weaker. We are now in a time of cooling but both towers of the cathedral are safe. We're still working to save the cathedral's work of arts," CNN quoted Nunez as saying. Gallet had earlier highlighted that the North Tower was under the risk of collapse, adding that the next "hour and a half" was crucial. "We need to win this battle and block the spreading of the flames. The most efficient action is from the inside. 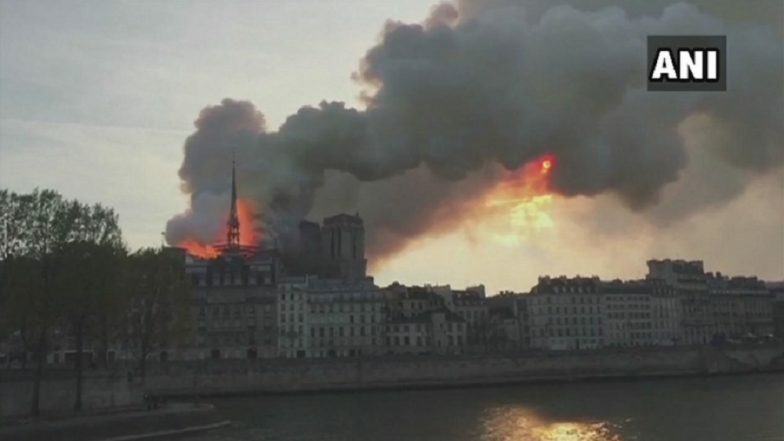 We are not sure if we will be able to stop the spreading of the flames to the North Tower...We are evacuating the most precious artwork that is being sheltered" he added. Speaking on the origin of the fire, Gallet revealed that the initial call to emergency services notified authorities of a fire in the attic of the cathedral on Monday evening. The cause of the fire, however, still remains unknown. The blaze has shaken the Catholic community all around the world. The cathedral is considered as the "beating heart" of French Catholicism, along with being viewed as a religious symbol by the community which is currently observing the Holy Week." The Holy See has learned with shock and sadness the news of the terrible fire that has devastated the Cathedral of Notre Dame de Paris, symbol of Christianity, in France and in the world. We express our closeness to the French Catholic and to the people of Paris. We pray for the firefighters and for all those who are doing everything possible to face this dramatic situation," the Vatican said in response to the blaze. As rescue efforts continue well into Monday night, mourners have gathered outside the cathedral, singing hymns and praying while kneeling. Speaking to reporters near the cathedral, French President Emmanuel Macron said that an international fundraising campaign to rebuild the Notre Dame Cathedral would be launched on Tuesday.